The Speaker Factory in Gaithersburg, Maryland is your best resource for audio loudspeaker services, audio component products, and technical guidance in the Greater Washington DC Metro area. We stand behind all speaker repairs and upgrades 100% as we are dedicated to your satisfaction! Our mission is to remain at the forefront of technology and to continue to advance The Speaker Factory “state-of-the-art” speaker systems in the areas of loudspeaker construction, design and musical performance. The speaker systems built have and will continue to be branded as TechniCoustics™, Pegasus Audio™, and our advanced technology/high resolution product line known as Quanta Technologies™. For nearly six decades our company has been producing speaker systems utilizing the most advanced internal construction techniques in the market place. Long before it became fashionable (circa-1960) we were utilizing a considerable degree of internal structural bracing in order to reduce noise/vibration in the cabinet panels. By reducing this noise, practicing good engineering design, and implementing high quality audiophile crossover components and drive units, The Speaker Factory has been able to produce some of the finest, most musically sounding speaker systems available. We have every intention of continuing this lifelong goal in the 21st century! Our newest Micro-Monitor M-5.1 was developed over a two-year+ period during 2006-2008. The first inspiration for this model came to the designer, Ray Indris, about 1973. However, variations of this model were built and sold over the decades, but never coming to full fruition until The Quanta Technologies™ Micro-Monitor M-5.1. What makes this model so unique is five decades of design work coming together as never before for this designer. Three major parameters must be reached in order to achieve the desired goals. We desired a neutral sound with a smooth flat frequency response. Well that in and of itself is a lofty goal and many companies achieve only that. We wanted more than that, that’s why it took over two and a half years in overall development. In addition to achieving the proper frequency response, we wanted to achieve two additional parameters. One of these that some designers strive for is a relatively flat impedance curve over the major portion of the frequency range. This is difficult to achieve, but not impossible. This buys us a relatively stable load so the amplifier sees close to the same impedance at most frequencies over the musical spectrum. This means the amplifier can put out an equal amount of power for most musical notes. This is an oversimplification, of course, but we hope we’ve simplified it enough. But that is still not the end of the story. We were driven to go even further to reach even loftier goals, far beyond all but a very small handful of speaker systems in the world. What could we do that so few speaker systems actually achieve? Our new goal was to achieve as flat a phase response curve as we could. You might describe it as “ruler flat!” That was very difficult and time consuming to achieve, which is why so very few speaker systems have this important characteristic. But why did we want a flat phase response? The short and simple reason is that we wanted our Micro-Monitor M-5.1 to be musically coherent. Most are not! To simplify that even more, our goal was to have all the musical overtones (harmonics) be propagated by the speaker at the same time as the fundamental notes. Your ear will then hear all the musical notes in their proper time perspective. The musical soundstage is more spacious, having greater height, width, and depth. The Micro-Monitor M-5.1 embodies these characteristics so that you will hear a much larger sonic image than many much larger systems. In fact their small size is also one of the reasons that they sound so big. You will need a sub woofer if you desire loud deep bass. But they do have gorgeous mid-bass to 55-58 Hz at -3dB. 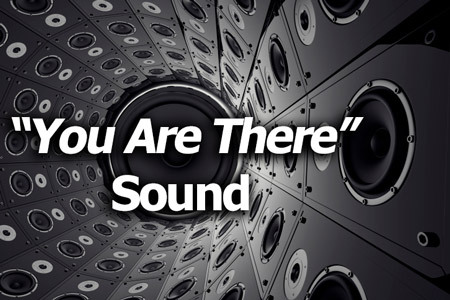 If our “You Are There” sound is your goal, please call for a demonstration. However, do not expect to take a pair home with you. All of our products are built-to-order with love and care and it takes a while to build each speaker to our impeccable standards.